John was born on 9 July 1816 at Percy Main to parents Roger Spence and Jane Attis.. His father was a miner. He was one of 17 children and was sent to work in the coal pit as a trapper boy aged 9. In 1828, Primitive Methodists missioned Percy Main and John attended service at Henry Wonder’s house. He was one of the first scholars at the PM Sunday School that opened in 1829. John was converted at the age of 14. At the age of 21, John left the pit to set up a small drapery business in his village. He remained at Percy Main until 1845 and then moved to North Shields. Whilst at Percy Main, John was a class leader and Sunday School Superintendent. John was generous in the building of the Saville St church in North Shields. He was station steward for many years and representative to the District meeting. He attended conference on several occasions. 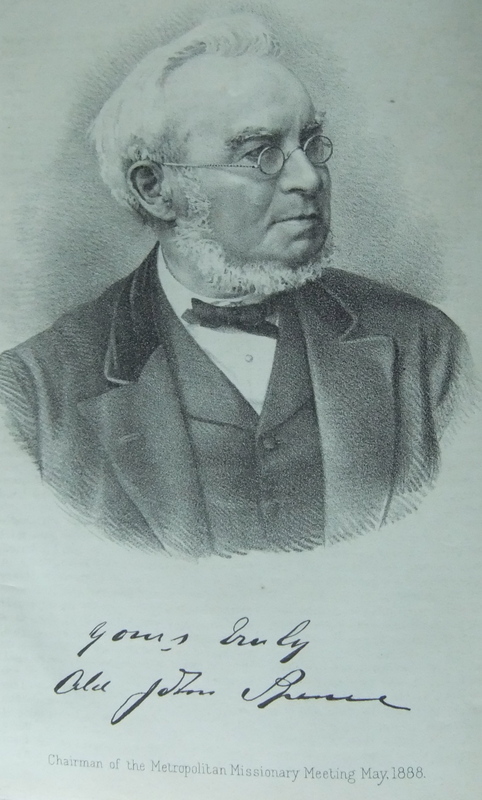 John was active in securing the Theological Institute at Sunderland and served as a Trustee. He was also a director of the Connexional Insurance Company. John was Chairman of the Metropolitan Missionary Meeting in 1888. John married Mary Hall (1820-1856) on 6 Apr 1842. They had eight children. John married Isabella Goodal Carse (1828-1894) on 14 January 1861. John died on 9 November 1890 at North Shields, Northumberland.